A desktop Dictionary that can translate any word by CTRL+Click. 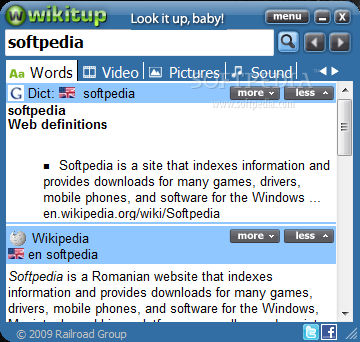 Wikitup is a straight-forward application that will help you search Wikipedia, Wiktionary, Wikiquote and many other services. You can also CTRL+Click any word on screen to see its translation. Wikitup can also find related videos, pictures and songs. Wikitup - Your Free Multimedia Encyclopedia and Dictionary. A desktop Dictionary that can translate any word by CTRL+Click. ...... up-to-date information. Wikitup is an open system that can be easily extended by developers.The world's knowledge at your fingertips! * Added awesome 3D image and video wall. Best Educational Game to teach children IQ. Educational aid of reading analog clocks. 11 dictionaries in a single package with translation from one to any language! Qweas is providing links to Wikitup 1.8.4 as a courtesy, and makes no representations regarding Wikitup or any other applications or any information related thereto. Any questions, complaints or claims regarding this application Wikitup 1.8.4 must be directed to the appropriate software vendor. You may click the publisher link of Wikitup on the top of this page to get more details about the vendor.